Is 4G worth the extra cost? Apple’s latest iPhone is expected to be the device that provides ‘the tipping point’ for 4G, the thing that will bring the service into public view as a must have. It will certainly provide the biggest real world test for Telstra’s year old and Optus’ brand new 4G service – year after year, studies demonstrate that iPhone users consume a disproportionate amount of mobile data compared to similar devices. The situation is slightly different to when 3G mobile data made its debut. At that point (around 2006) mobile data was very much a stop-and-go affair; speeds of 384kbps were the benchmark for mobile broadband. This lack of speed, combined with tiny and limited interfaces for input and consumption made it a service mainly used for weather updates, email and very painful browsing. In short, it was barely worth worrying about. 3G, with its speeds of 1500kbps and beyond, combined with the iPhone to make mobile data a proper option. Full browsing was now available, as was watching streaming videos and listening to streaming music. Skype on 3G threatened to destroy the mobile industry as we knew it, the same way DVD killed Hollywood and Radio laid waste to the live music industries (*ahem*). 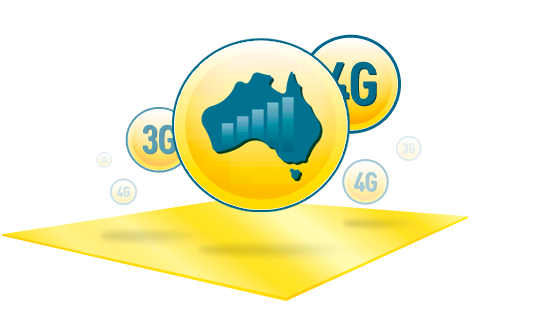 Over the last few years 3G has advanced to different standards, the most advanced being HSPA+, currently deployed by all three Australian networks (Telstra, Optus and Vodafone). This standard provides typical speeds between 3 and 15 Mbps in the real world, despite being capable of much higher speeds. All three networks, even Telstra’s vastly denser NextG network, are suffering from over-contention – too many people using the network for too many applications. As such, data allowances have slowed down from a rapid escalation – all three networks seem to be reluctant to allow popular plans past 12GB, with more expensive plans hitting a wall at 18GB. Meanwhile, the average amount of data used by Australians has edged over 20GB a month. What is 4G, and what is LTE? 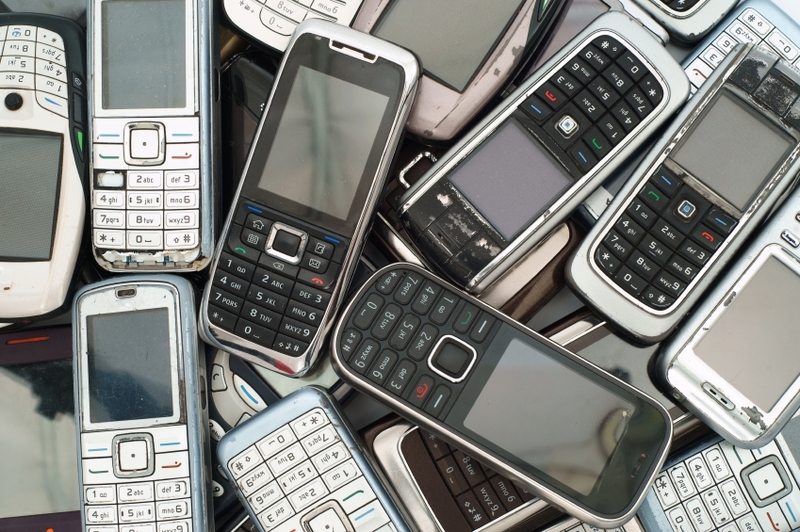 4G is an evolution of 3G, rather than a radically different approach to mobile communications. The way data was actually divided and parsed out under older standards was very different to how 3G did the same, but 4G is mostly doing more of what 3G did. In very brief terms, it’s less about what band of radio is used than about putting more cells in place. Advanced 3G and 4G both work on the basic principle of utilizing an abundance of existing technology to boost speeds, rather than a seachange in how the network operates. The term ‘Long Term Evolution’ is a little more broad, intended to refer to more nuanced methods of getting more speed out there. The most common idea is ‘load shedding’ data to Wi-Fi hotspots operating off high speed fixed line connections. But even then the term is thrown around a bit – Telstra in particular has started using the term LTE more than 4G, even though it doesn’t use this particular method. So in short, LTE and 4G are terms that are slightly more nebulous than 3G. What it means in real terms are typically higher ‘burst’ speeds. This is a brute force attempt to get around the barriers of wireless broadband technology. If a good line-of-sight 3G link can provide speeds of 10Mbps, and when interrupted get slowed to a tenth of that, then a 4G connection made in the same way providing 40Mbps, and then a tenth when interrupted, will result in less of a noticeable drop off in quality for your average user. But the issues of contention, low data allowances (relative to fixed line) and ‘rain fade’ (the drop off in quality of radio communications due to atmospheric conditions) isn’t going to be properly fixed any time soon. 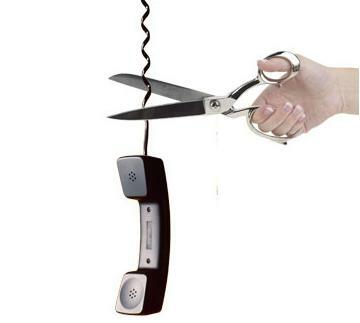 Can 4G replace fixed line? Here in the office we tested an iPhone 5 on Telstra’s 4G network. The results were exciting. 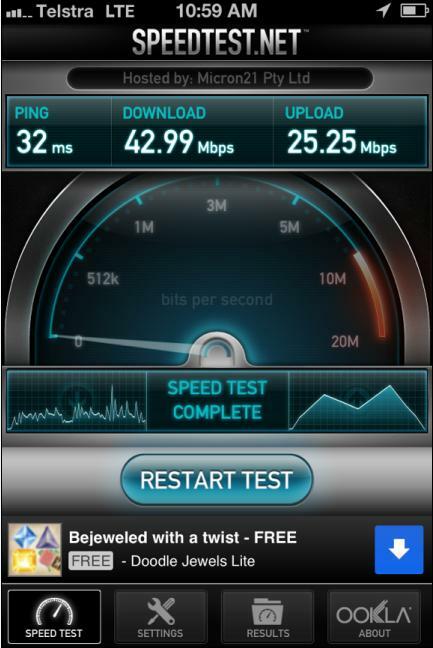 The speed test dial SLAMMED into the other side of the meter, reporting back a stunning 42Mbps, with 22Mbps upload. That’s not faster than ADSL2+ - that’s faster than ADSL2+ is even capable of, and faster than most Cable connections. Of course, this is a mirage. The plan allowed for 2.5GB of data – standard for Telstra mobile plans under $100. Even Optus’ more permissive wholesale network, through providers like Amaysim and Dodo, typically only includes 4 or 5GB. Any application that can make good use of such high speeds would use much more data with any type of sustained use. This includes high def video streaming (including things like Facetime, which is actually useful) and downloading/uploading of objects. These are the main drivers for faster broadband – for browsing and email, these high speeds are a bit of overkill. This is mostly an issue for people who use mobile broadband as their main home connection, rather than ADSL. If you use very little data, but you’re too far from the exchange to get a decent speed, then that’s the sweet spot for 4G. But right now, 4G is mostly confined to within 5-10 km of major cities on both Telstra and Optus’ networks – and those are exactly the people who suffer less from speed issues on ADSL. Meanwhile, cheaper phones and plans using 3G typically enjoy more data. This is a bit skewed, because for now most cheap providers only have access to 3G networks – as 4G replaces 3G, then there will be no discrepancy. But for the next 12 months or so, going for a plan on 3G will expose you to cheaper plans with more data, and to a wider range of phones. Anyone feeling bad on missing out should consider two things – the people migrating to 4G will free up capacity on 3G networks (which will be in use for a while, even if only for actual voice call transmission). And 3G still provides more than adequate speed for the type of low-data applications that mobile data is best suited for. More importantly is the way these speeds are being generated. Mostly it’s down to more and more towers (so that cells overlap to provide strong signal) and boosting the amount of data-per-second being fed to each tower. That means fibre underneath the tower. That means more fibre. More towers, with more fibre. See where this is going? Mobile Broadband gets better the less ‘mobile’ it is, which is absolutely no surprise for anyone. If towers get 1km apart, and they’re all fed by thousands of km of fibre networks, then the cost of patching fibre to each home becomes less and less. Faster wireless and faster wired connections go hand in hand. A future in which everything is wireless might be possible, but not without cost. Wireless communications requires more power, more radiation and lower quality than fixed line, while only offering mobility as compensation. At some point, long range wireless communications will reach a saturation point where we use it as much as we can, before requiring a fixed line connection. Thankfully, advances in one means advances in both, and we’ll have the option to use each as the situation calls for.